The Shimano Calcutta TE DC Round is no longer available. To find a comparable reel, please use the menu to the left. "IVE HAVE BOTH THE CALCUTTA DC AND THE CALAIS DC, WHEN I WAS AT BPS (HOUSTON) THE GUYS KET TELLING ME JUST BUY THE CALCUTTA AND SAVE SOME MONEY, BUT STUBBORN ME WANTED THE CALAIS." "just bought this reel a couple a days ago and put it on a gloomis, spooled up with 10 pound test, and then tied a half ounce sinker on and let it rip. just about all of the line went off of the reel. 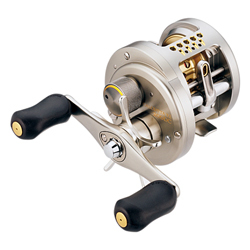 this reel is amazing absolutely the best reel i have ever purchased." "This is a great reel hands down. It has an extremely smooth and strong drag. It looks like a piece of artwork. It has amazing casting distance. Dont think that this reel cant backlash, it is rare but when it does, get the scissors. " "I just bought the 200 sized reel and I love it! I also bought a St. Croix LTB Teaser rod to pair it with. The casting ability of this is absolutely incredible. I put 12lb. Berkley XL line on it and am using it for throwing plastics and then switch the reel to my crankbait rod for crankin' duties."